Is anybody out there feeling a little less than totally confident about your own ability to provide a vibrant music program in early childhood settings? Worried that you don’t sing well enough or you aren’t a good enough musician? Not sure what a good music program looks like, let alone how to implement one? I’m betting there are quite a few hands going up out there. Because you are not alone: research shows that music is the single most-feared subject area for educators. More than math, more than science – it’s music that we feel inadequate about. I can’t to I can! In my final year at university I had to do a major research project; I chose early childhood educators’ attitudes to implementing music programs in child care settings. My results were very similar to that found in published research: educators were mainly fearful of music programming. They felt inadequate – they felt they were not doing a good job at providing music programs in their work. They felt ill-prepared by the training they had received when studying child care – indeed, the more highly-qualified they were, the less likely they were to feel comfortable about their abilities! They felt they needed to be a great musician to do a great music program, but they didn’t believe they needed to be a great artist to do a great art program, or a great writer to do a great literacy program. The reasons were complex. Educators spoke of bad experiences with music when they were at school, of boring, rigid lessons and being told to mime in the class choir at assembly. Some said they had studied a musical instrument privately as a child; not one still played, and most had stopped lessons before they were 13, mainly because the lessons were tedious and focused on passing exams; music had stopped being fun. They said that music got only a tiny mention in their child care courses – a few hours at most, often sandwiched into a course that focused almost exclusively on art. They said the people teaching the courses were clearly not comfortable with music themselves. They said they weren’t provided with a range of music ideas and activities in their course; often they got nothing except a brief lecture on songs and fingerplays; most got no training in implementing instrumental music programs at all, except for how to make a shaker or a simple drum. They said that it was very difficult to find resources or ideas for extending music programs in child care settings. So that’s the bad news (good news follows). At this point you may be nodding your head. But I haven’t told you these things to confirm your own fear of music or to persuade you that really music should be left to musicians and trained music teachers. I’ve told you this because I want to challenge those ideas and I want you – you personally – to challenge them too. I want you to know it doesn’t have to be that way. They were quite right about one thing – you don’t have to be a great writer to do a great literacy program or a great artist to do a great art program. The real tragedy is that every one of these people was quite capable of doing a wonderful music program – but they didn’t know it! And their music programs were actually quite good – they were doing a far better job than they thought they were. Here’s the good news: you don’t need to be a great musician to do a great music program. You don’t even need to be a good one. Or to be able to sing in tune. Here’s the REALLY good news: your children think you are a brilliant musician with a fantastic singing voice and they love doing music with you! 2. If you provide a music-rich environment for play, children will learn music for themselves. That sounds a bit too simple, doesn’t it – but it’s true. Play is the natural way for children to learn anything, and that includes music. When children explore music in a play-based program and an environment that offers ample opportunities for music play they will learn the basics of music instinctively and naturally. What’s more, they will learn attitudes to music that more formal instruction often won’t teach them. They will learn that music is fun, that it is easy, and that it is something that they can do – and do well. They will learn the most important music lesson of all: the real reason to play music is for the joy of it; for the intrinsic reward that comes through exploration and play. That same research I cited earlier has another vital piece of information in it: the best predictor of an educator’s ability to provide high quality music programs is NOT the educator’s musical ability. It is the educator’s level of confidence in their own ability to provide good music programs that counts. It’s not whether you can play the violin like Paganini, or sing like Kiri Te Kanawa that matters. It’s that you believe in yourself, that you believe you can design and implement good programs. Enough with the research, already! So that’s what the next four parts of this series will be about: learning to believe in yourself, & becoming confident in your abilities to design fantastic music programs. I know you can do it – you can be just as confident about music as you are about the rest of your program. You already have all the skills you need, because you know how children learn. The rest is easy. In the second part of this series I will look at the most important part of the music play environment: you, the educator. I’ll look at singing, and how you can sing more – and enjoy it. In Part Three I will continue my look at you, the educator, but this time it’s all about instrumental music and how you can be a positive role model for music play. In Part Four I’ll look at “what is a music-rich play environment?” I will look at how you can increase the range of music activities you can provide, add appropriate opportunities for music play, find new instruments that will cost you little or nothing, and use intentional teaching strategies to enhance children’s understanding and extend their learning through play. In Part Five I will sum up, offer ideas for further extending music learning and look at ways of finding and sharing music programming ideas. 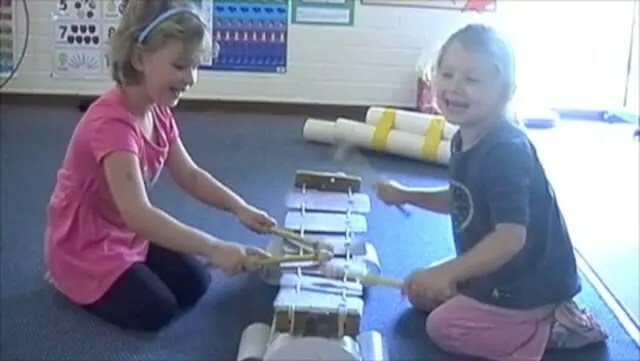 This entry was posted in Music in ECE Yes You Can, Music play and tagged Child's Play Music, Confidence, early childhood education, early childhood educators, music play, music programming, music programs, Music research by Alec @ Child's Play Music. Bookmark the permalink. Alec, this is wonderful and should be compulsory reading for all ECE students! I absolutely agree with everything you say. I remember sitting in on mat times with a diploma-qualified carer who was certainly not a great singer but who didn’t care about that- she only cared that the children had the experience of music and she was determined to provide it. Those children just flourished in that atmosphere. She used CDs to support her singing a lot of the time, which gave the kids a great pitch foundation. The looks of joy on those kids faces- I’ll never forget it. These weren’t upper class kids with musical backgrounds, either- quite the opposite, many were foster children and children from violent backgrounds- but at music time they were fully engaged and interacting. I complimented her on it later, and she was so surprised- “But I’m not a good musician,” she said- but the encouragement I gave her was so important too and she really appreciated a word of support. If we ARE good musicians, it’s so important to remember to encourage our colleagues and help them- which is exactly what you’re doing. Thanks for your supportive comments, everyone. @Aunt Annie – I agree that as musicians we need to support our colleagues. Many are doing good work without realising it and validating that is so important. Sharing our knowledge and enthusiasm is vital, too – I know I’ve benefited greatly from colleagues who knew more about art than I do, for example. @Kimberly – that’s great to hear! It’s all about making music an integral part of the program (not an add on), and offering extensive opportunities to explore music in all its forms. @Ms. Dawn. Attitudes are the very core, I think. I want children and educators to truly believe that music is important, that it is fun, that it is easy, that anybody can learn to play music. If you think that something is ‘too hard’ it becomes a self-fulfilling prophecy. Similarly, if you believe that something is doable, you find a way to do it; “I think I can” becomes “I know I can”, which is a great feeling. As a music educator in early childhood – well said Alec! The most important thing we’ve found, and research confirms it, is that the children engage when learning through play with adults they connect with. Children at a young age are not critical or judgemental enough to notice the quality, only the quantity and the fun. At Musical Child we whole heartedly agree that it’s all about music as part of early childhood development. It has so many amazing benefits we see every day.